DVB-S is digital satelite TV. 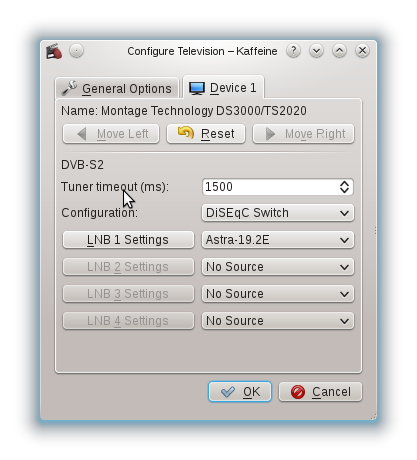 To set up DVB-S with Linux you will need to know your receiver, in this example we assume the TerraTec Cinergy S2 USB HD, and the satelite you can receive, in this example we assume ASTRA 19.2E. Vendor: usb 0x0ccd "TerraTec Electronic GmbH"
Device: usb 0x00a8 "USB Stick"
does not work with this stick, hwinfo does not show a line with "Driver". Then I rebooted. Now the dvbtune command from above returns. And I can watch satelite TV using the application kaffeine. This page was last modified on 21 August 2012, at 05:25.